Check our compatibility guide if you want to know if Acrolinx for Chrome works with your local platform and with your Acrolinx platform. You can use Acrolinx for Chrome to check content in editable fields on most web pages. Acrolinx for Chrome is great if you have web content that you want to check but don't yet have an Acrolinx product to use in your web CMS. Acrolinx for Chrome is available in the Chrome web store. You can install it like any other Chrome extension. Open Chrome and go to the Chrome web store page. Search for Acrolinx for Chrome. Click and you'll see a notification appear. Click Add extension to grant the extension access to your data and install Acrolinx for Chrome. You don't need to do anything to update Acrolinx for Chrome, it happens automatically. Open Chrome and click More . Find Acrolinx for Chrome and click Remove . You can toggle showing and hiding the Sidebar by clicking in your Chrome toolbar. 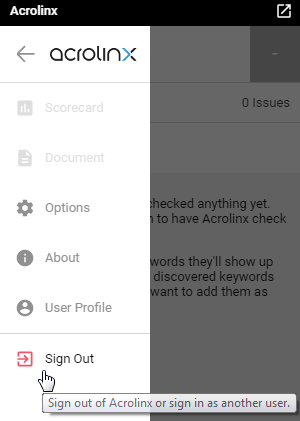 You can change your Acrolinx Server address by signing out and signing in again. Sign out from the slide-out menu in the Sidebar. Secure the Acrolinx Server with SSL because Acrolinx for Chrome only connects to Acrolinx Servers using HTTPS. This means that the server address in the Sidebar has to start with the prefix HTTPS and follow this pattern: https://<SERVER_ADDRESS>:<PORT>. To use Acrolinx for Chrome you'll need to Enable Cross-Origin Resource Sharing (CORS) on the Acrolinx Server. Check out this article on how to Enable Cross-Origin Resource Sharing (CORS) on your Core Server.